Wanted: Someone who can run this country efficiently, democratically, who can inspire great loyalty from his or her supporters, while also receiving grudging respect from the other side, and who, in the final result, can bring us together in the way some of our greatest presidents did. Because we don’t need another American Revolution, or another Civil War. Think I’m being sarcastic, or that I’m joking? Think this is all much ado about — well, not too much? Well, you’d better think again. Because this great country, the greatest in the world in the opinion of me and millions of others, is nearing the edge of a horrendous collapse. Yes, you heard me correctly. Even though the unemployment rate has dropped since President Trump took office; even though he has proved that he can wheel and deal with major industrialists to create more jobs for American workers, and with foreign leaders to try to straighten out the mess the world is in after eight years of Barack Obama; even though he has managed to achieve some major goals in his first 100-plus days in office, he is facing monumental challenges. Why? Because the liberals who thought Hillary Clinton had it “in the bag,” who thought they were going to crown “America’s first woman president” on January 20, who thought the idea that Donald Trump might win on Nov. 8 was ludicrous: They lost. And they cried. And they still haven’t gotten over it. They don’t WANT to get over it. And to so many, many of them, nothing matters now but defeating Donald Trump — keeping him from achieving anything significant, protesting his every move, rioting, on some occasions, as part of their ongoing rage against the man they hate. And of course, any condemnations of all that from Democrats in Congress, have been almost at a “zero” level. But the Republicans haven’t been very vocal about it, either. Which is another side to our national crisis. The Republican leadership in Congress appears to be not only half-hearted about supporting the leader of its party, who is now the President of the United States, but also not very deft at the art of politics. No, not “stupid” in the sense of low IQs or anything like that. But they often don’t seem to have a good grasp on how politics is played. While the Democrat leaders are at it, 24/7. 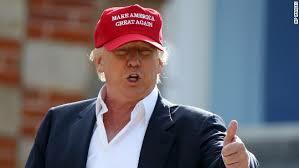 The only things that matter to the Dems right now, is to sabotage Donald Trump, no matter what they have to do to accomplish it; and to win the next election. “All else is commentary,” as a famous Jewish leader of the Middle Ages once said. And the mainstream media have become absolutely obsessed with daily “leaks” designed to depict Donald Trump in the worst light possible. Even Garry Varvel, the talented, conservative editorial cartoonist for the Indianapolis Star, now often draws anti-Trump cartoons. If this had been perpetrated against Barack Obama, the screams of “Racism!” and “Bigotry!” would have resounded all the way to Jericho. But since it’s Donald Trump, it’s perfectly OK. “Just the facts, ma’am.” Oh, sure! So. We have one political party which at least has some goals to help America, even though it’s often clumsy and self-defeating at trying to reach them; and the other party that seems to prefer bringing this country down like a collapsing building, rather than allowing Donald Trump to succeed at anything. We are between a rock and a hard place. Now, I’m a supporter of President Trump. Voted for him. He’s brilliant, energetic, has some great ideas for the improvement of the United States, which he’s trying to implement. But, he does shoot himself in the foot occasionally. He has a tendency to “spout off” about things, without taking the time to consider how they will sound to the American people. He should cut back on the “Tweets,” too. And he knows full well that the mainstream media and the Democrats will pounce on anything he says like a frog on a junie bug, and try to distort it and make it sound just as insensitive-stupid-dangerous (fill in the blank) as possible. Because, the Left doesn’t care about solving national problems; it just cares about destroying Trump. And, winning the next election, as I said before. Some Trump supporters fear that the lunacy on the Left could turn into an open, armed rebellion against Trump and the Republican-led Congress — a second Civil War, you might call it. I suspect that many on the Left would like nothing more than to see such a rebellion. Keep in mind that the Right probably holds about 90 percent of the firearms in this country. And that in this election season, and its aftermath, some of the “protests” staged by the liberal-radicals have been countered by mobs of Trump followers, with fights between them often breaking out. And that the members of the armed forces tend to be strong supporters of President Trump. Wrong. There is ALWAYS something you can do about it — if you’re willing to grow a pair, put on your big-boy pants, and do it. And I think that the time is coming — soon — when the Right is going to start DOING SOMETHING about all this nationwide mess we’re embroiled in. 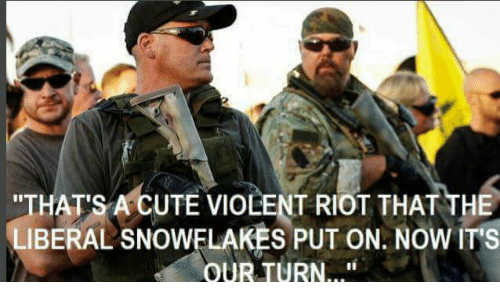 Can you say, “Mass shootdowns of leftist rioters”? How about, “thousands arrested after riots; hundreds hospitalized after being beaten by police”? You liberals are so fond of talking about how Trump is “dangerous,” as I just said. Well, if in fact he IS, can’t you imagine a scenario where he suddenly puts in motion a “coup from the top,” possibly having all the House and the Senate physically evicted from their respective houses, putting out a nationwide call to all police to get tough — I mean REALLY tough — with anti-Trump rioters, “Black Lives Matter” thugs, with anyone else who is trying to put the U.S. in a state of permanent disruption; and telling the Border Patrol to keep out the illegal aliens, by any means necessary? Is that what you really want, liberal trouble-makers? I seriously doubt it. You’ve gotten accustomed to getting away with whatever violent disruption you choose to stage, because the police were intimidated by eight years of Obama rule, of being treated with suspicion and hostility by the federal government, over and over again. What if suddenly they were sure that the President of the United States had their backs, whatever they had to do to restore order? Do you really think that Donald Trump would not, under any circumstances, set in motion such extreme measures? And as I said earlier, people who support Trump hold a great majority of the firearms in this country. Do you want to see a return of the Vigilantes, the Posse Comitatus? People on the right are becoming really sick and tired of you and your antics. Think about it, liberals. If these things come to pass, I guarantee you won’t like it. But I suggest that many of the rest of us will. The first American Civil War occurred when half the country refused to accept the results of a democratic election and opted for secession. Will the second American Civil War begin when a large number of Americans refuse to accept the results of a democratic election and opt to remove the winner by any means necessary? As I say in the column, David, it could be the side that elected him that opts for violence. You covered this very well and well said, Old Corporal! It’s such a shame that people can’t put politics aside and put AMERICA first again!